The “law of one price” holds that identical goods should trade for the same price in an efficient market. But how well does it actually hold internationally? The Economist magazine’s Big Mac Index uses the price of McDonald’s Big Macs around the world, expressed in a common currency (U.S. dollars), to measure the extent to which various currencies are over- or under-valued. The Big Mac is a global product, identical across borders, which makes it an interesting one for this purpose. But the law of one price assumes there are no restrictions on, or costs involved in, the movement of goods, and Big Macs travel badly. So in 2013 we created our own Mini Mac Index, which compares the price of iPad minis across countries. Minis are a global product that, unlike Big Macs, can move quickly and cheaply around the world. As explained in the video here, this helps equalize prices. 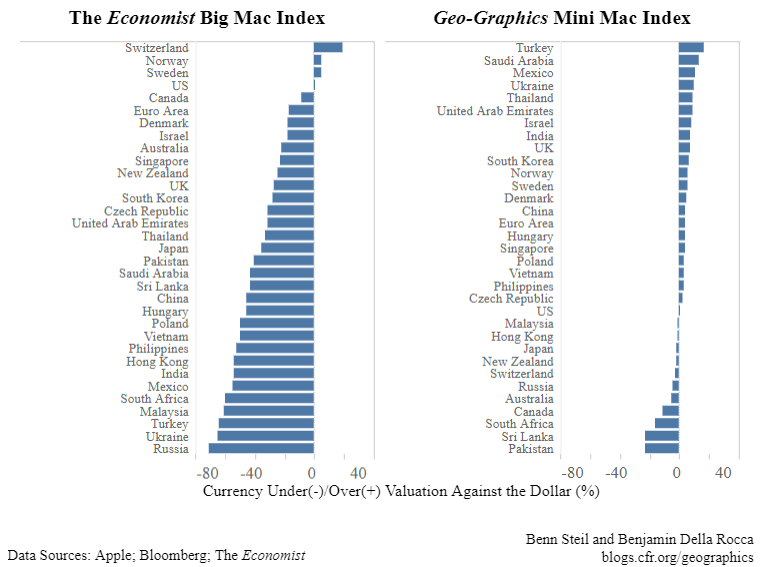 As shown in the graphic at the top, the Mini Mac Index suggests that the law of one price holds far better than does the Big Mac Index. The Big Mac shows the dollar overvalued against most currencies, by an average of 35 percent (a whopper). By contrast, the Mini Mac shows the dollar slightly undervalued—one percent on average (small fries). Still, the Mini Mac indicates that the dollar has strengthened slightly since last summer, driven mainly by emerging-market outflows. In particular, foreign investors have poured out of Pakistan, Sri Lanka, and South Africa, countries that depend on dollars to fund current-account deficits. The Mini Mac valuations of their currencies have plunged 22 percent on average. Russia is the source of the most significant gap between the two indexes. In the wake of new U.S. sanctions, the Mini Mac finds the ruble falling from a one-percent overvaluation to a five-percent undervaluation. The Big Mac, meanwhile, suggests an implausible 70-percent undervaluation. We don’t want to be too cheesy, but that just won’t cut the mustard.